Sacred and secular utensils from the late 14th to the early 20th century from the collections of pewter crafts, bell founding, brass- and coppersmithery. The exhibition includes approximately 250 pieces from the collections of the Museum of Warmia and Masuria in Olsztyn. Its main part is the collection of tin – approx. 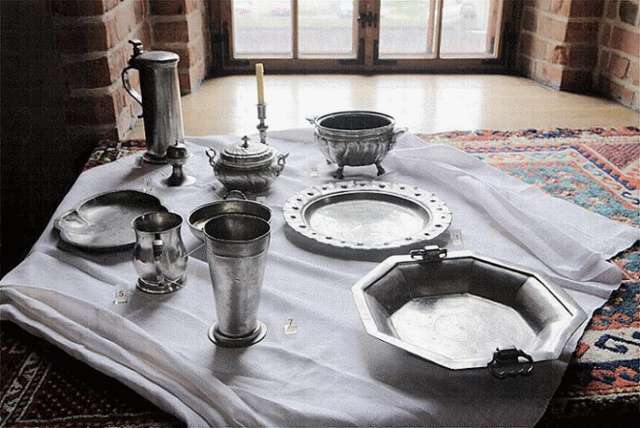 170 vessels and utensils, supplemented by copper products and selected bronze and brass utensils. The oldest of these objects, dating back to before the end of the 18th century, are the products of guild masters associated in metal fraternities – coppersmiths and foundrymen: pewterers, bell founders and brass smiths. Items from the second half of the 19th, and early 20th century are mostly factory-made, usually repeating or referring to old patterns, except for tin and its alloys and copper, in which case we find excellent examples of Art Nouveau design and ornamentation.